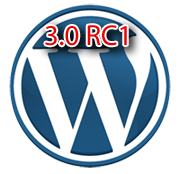 WordPress 3.0 Release Candidate 1 (RC1) is available for download. A “Release Candidate” comes after the beta release and before the final launch. Also, a “Release Candidate” has all features finished and all potential issues fixed. However, there are millions using WordPress with a wide variety of configurations and hosting setups, so it’s possible that they have missed something. _Custom menus are finished! Yay! _There are a ton of changes, so plugin authors, please test your plugins now, so that if there is a compatibility issue, we can figure it out before the final release. _Plugin and theme users are also encouraged to test things out. If you find problems, let your plugin/theme authors know so they can figure out the cause. _The look of the WordPress admin has been lightened up a little bit, so you can focus more on your content. I like this WordPress 3.0 RC1.